KAI provided architectural and plumbing and fire protection engineering services for this $27 million, 35,700 SF multi-modal building. The building provides facilities for train (Amtrak) and bus (Greyhound) in a single 700-foot long structure. A MetroLink light-rail station, a local bus transfer station and a taxi stand are all immediately adjacent to the building to the east. The long, linear configuration of the building is not only a direct response to the site conditions (under an existing highway), but is also reflective of its purpose of moving people from one mode of transportation to another. The concept of movement is expressed not only in the building’s flowing linear plan and angled facades, but also through the use of vibrantly colored glass in rhythmic patterns on the building facades. 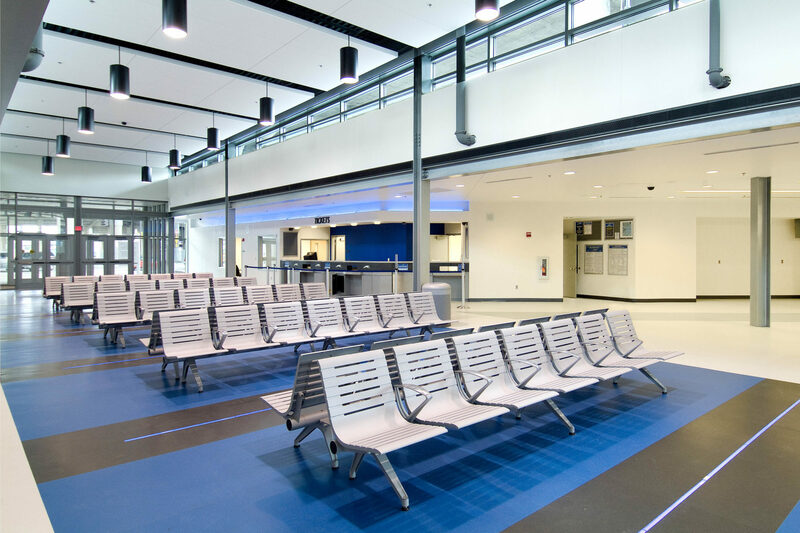 The Gateway Station replaces a much-outdated modular structure that had been serving Amtrak's passengers. Intended only for temporary use, the modular station (dubbed "Amshack") had remained in service for 26 years. The award-winning and beautifully-designed Gateway Station is a welcome replacement.